Ron Snelson, SBC director of external affairs, left, presents Jacqueline Taylor, associate director of the University of Houston Small Business Development Center region, and Bob Barragan, SHSU SBDC director, with a check for $5,000. The SBC Foundation, the philanthropic arm of SBC Communications Inc., has awarded a $5,000 SBC Excelerator technology grant to the Small Business Development Center (SBDC) at Sam Houston State University. The main objective of the SBDC is to help small businesses get started and to help existing businesses raise their profit potential. The Piney Woods Entrepreneurship and Small Business Success Program, which consists of six seminars, began in March. "The Piney Woods program is a continuation of highly successful programs from past years, beginning in 1993," said Cecilia Cowart Schlicher, training coordinator at the SBDC. The funds awarded to the Small Business Development Center will support this year’s programs, including the March luncheon which featured Peggy Morrow of Houston. Past speakers include Jim “Mattress Mac” McIngvale of Gallery Furniture in Houston, Bud Hadfield of Kwik Kopy Franchise Corporation, and Suzanne Penly of Customer Focused Systems in Houston. 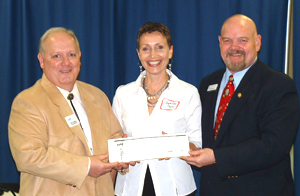 The grant was presented by Ron Snelson, SBC director of external affairs. SBC Excelerator is a major philanthropic initiative that connects the nation’s neediest residents – including at-risk youth and underserved urban families – to important community resources. The program empowers nonprofits to use technology to expand the reach of services and heighten the impact those services have on people in the community. The Excelerator program provides access to important resources in the community, such as Internet access, hands-on computer training, math and reading classes, and job skills programs. Network connectivity enabling easy sharing of database applications and information systems. emphasize education, community development, health and human services, or arts and culture. In 2004, the SBC Foundation provided $5 million in SBC Excelerator competitive grants to 436 nonprofit organizations throughout the SBC 13-state region. The competitive grant program is part of an overall $8 million 2004 SBC Excelerator initiative. Now in its third year, SBC Excelerator has provided more than $27 million to nonprofit organizations around the country to build stronger communities and improve lives by supporting improved technology resources. The SBC Excelerator program is the largest special grants program ever undertaken by the SBC Foundation, one of the top corporate foundations in the nation, according to The Foundation Center. The 2004 SBC Excelerator program marks a significant part of the SBC Foundation’s 20th anniversary year. Since 1984, SBC Communications and the SBC Foundation have contributed more than $1 billion to nonprofit organizations across the country. According to Business Week magazine’s 2003 Special Report on Corporate Philanthropy, SBC Communications ranks as one of the largest providers of corporate philanthropic funding in America.